In 1926, the path US 2 now follows existed, but was not numbered. Between the Montana state line and Bonners Ferry, the road was dirt. 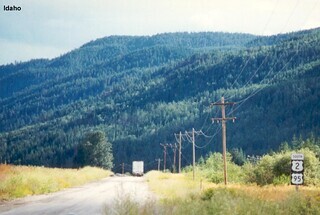 From Bonners Ferry to Sandpoint, the road was improved (not paved), then was mostly dirt to the Washington state line. In 1928, the route between the Montana state line and Bonners Ferry had been numbered US 2. At this time, US 2 ended in Bonners Ferry. Between Bonners Ferry and Sandpoint, the route US 2 now follows was numbered US 95. Between Sandpoint and the Washington state line, the path US 2 now follows was numbered US 195. By 1930, the road had been improved (not paved). By the late 1940s, US 2 had been extended to Everett, Washington. The road was paved in Idaho, except between the Montana state line and Moyie Springs, where the road was still improved (not paved). Between 1950 and 1956, the last section of US 2 in Idaho was paved. In 1956, US 2 followed what is now Old US Highway 2 between Bonners Ferry and Naples. By 1980, US 2 had been rerouted to its current path through Idaho. Additional information about the history of US 2 in Idaho can be found on the Highways of Idaho website.